This group was not your typical collection of girlfriends singing together in the neighborhood; they were mostly from different sections of Brooklyn. The eventual quintet was a creation of Benny Wells, a former big-band musician and by 1960, the groups manager. Wells rehearsed his acts in P.S. 73 on MacDougall Street. Deciding in the fall of 1960 to form a group, Wells recruited his niece, seventeen year Barbara Alston, from Lexington Avenue in the Bedford-Stuyvesant section of Brooklyn. Kate Henry who worked at P.S. 73, brought in her 15 year old daughter Delores (Dee Dee) Kennibrew, who lived on Bergen Street in the Crown Heights section and went to Wingate High School. Alston recommended 17 year old Mary Thomas of Sumner Avenue in Williamsburg and 17 year old Merna Girard of Kingston Avenue. Since Wells didn't write, he got his material from various songwriters such as Skank Avenue's Leroy Bates. When the group wasn't rehearsing at P.S. 73 they'd go to Bate's sister-in-law's house where there was a piano. His sister-in-law, 17 year old Pat Wright of Bushwick High School became the fifth member. They became the Crystals when they named themselves after Bate's baby daughter "Crystal" Bates. Early in 1961 Wells took the group to the Celebrity Club in Freeport, Long Island, to get the feel of a stage and live performing. This would be the group's only public appearance until after their first record. Still looking for hit material Wells met Hill and Range songwriters Bill Grant and Bernie Baum, who arranged for the girls to rehearse at the publishing company's offices in midtown Manhattan. While rehearsing "There's No Other" one evening in March, 1961 the group met Phil Spector. Originally done uptempo, Spector slowed it down, creating an entirely different feel. Continuing to rehearse until late June, they were finally called in to Mira Sound on West 47th Street in New York City to record on the night of their high school graduation prom. Barbara, Mary, and Merna showed up at the studio after 10P.M., still in the prom dresses that they wore at Commercial High School prom, to record "There's No Other" and "Oh Yeah, Maybe Baby." The scheduled September release had "Oh Yeah" as the A side. The first in a series of surprising events in the Crystal's career happened when the record came out not on Liberty as they had expected. ( since Spector was involved with that label) or even Big Top (which was affiliated with Hill and Range, for which Spector was expected to do some production work for). It came out on Philles, a label started by Spector and Lester Sill. By the time it reached radio, "There's No Other" with it's solo intro by Barbara and Chantels styled harmony, was the popularly elected A side. The record entered Billboard's Pop listings on November 20th and peaked at number 20 in January 1962, also hitting number five R&B. Their first live performance was at the Apollo Theatre. Influenced by the Bobbettes, the Chantels, and the Shirelles, Spector was reshaping the Crystal's sound to redefine the girl group style. The first indication of this was with their second single, the Mann/Weil written "Uptown." The song was about a battle weary man who finds strength and pride when he comes "uptown' to her arms, was ahead of it's time in it's raw realism. At this time there were six Crystals; 16 year old LaLa Brooks had been brought in to replace the pregnant Merna Gerard. Uptown hit the charts in the same month of it's release March, 1962. It reached number 13 Pop and 18 R&B. Spector chose to let the instruments overshadow the voices on this brilliant recording that just stopped short of being too busy. Their next song "He Hit Me (and It Felt Like A Kiss), was written by Carole King and Gerry Goffin, was based on a story their babysitter had told them about being beaten by her boyfriend. (The babysitter was Eva Boyd, who by August would have a number one record "The Locomotion," under the name of Little Eva that was written by Goffin and King. Despite it's good reviews and instant airplay the Crystals hated it and so did Spector's partner Lester Sill, feeling it was a depressing, negatively influenced song. Most of the public never got a chance to decide; as watchers of the nation's morals began complaining to the radio stations over the lyrics. Philles immediately pulled the record. The Crystal's next career surprise was a recording of "He's A Rebel," a song previously turned down for the Shirelles by Sceptor Records' head Florence Greenberg as being to adventurous. What Spector did keep on this Gene Pitney song was Darlene Love and the Blossoms vocals. Spector felt "He's A Rebel' would sound better would sound better with a with the powerful lead voice of session singer Darlene (Wright) Love. Wright's fiery vocal, straight out of the Pentecostal choir, was exactly the sound Spector wanted for this celebration of nonconformity. "He's A Rebel" came out in August, 1962 immediately after "He Hit Me" and listed the Crystals as the artists. The reached number one the week of November 3, 1962. (The number two record that week was Gene Pitney's "Only Love Can Break a Heart"). The song became an anthem for teen girls who secretly longed for good hearted bad guys. With their biggest hit, the Crystals weren't sure if any of their harmony work was used. After "He's A Rebel" Mary left the group to get married and the group would remain a quartet. The Crystal's next single "He's Sure the Boy I Love," with another successful spoken intro Mann/Weil song #11 pop 1963, #18 R&B"). Again Darlene Love and the Blossoms were the actual performers. Now deciding that he preferred La La Brook's lead voice to Alston's and Wright's, in March 1963, Spector flew her Brooks to Los Angeles to do lead vocals over Darlene Love's original tracks on the Barry/Greenwich/Spector song, "Da Doo Ron Ron". Released in April under the Crystals' name, it was basically Brooks and the Blossoms. By the week of June 8th, it had reached number three on the charts. Their seventh single, entirely by the Crystals, was "Then He Kissed Me" another Barry/Greenwich/Spector song and entered the Billboard Top 100 on August 17. This song established the "wall of sound." By September 14th it was six Pop and number eight R&B at a time when seven out of the top ten records were by British groups. January 1964, the Crystals released "Little Boy." Over produced, a fine arrangement and song was wasted. Also, Philles was now preoccupied with it's newest talents, the Ronettes. "Little Boy" saw little airplay and reached no higher than 92 in February. By now, Pat had left to get married and was replaced by Frances Collins. Their last Spector record "All Grown Up" had been recorded the year before. It reached number 98 on August 1, 1964. 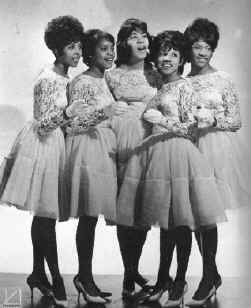 In 1965 the Crystals signed with United Artists Records and released two singles which went nowhere. Soon thereafter Barbara married; the Crystals split up around 1967. Dee Dee also got married, but around 1971 she reformed the group with LaLa, Mary, and Barbara for a Richard Nader rock and roll revival show. From 1971 to 1973 they toured and performed until motherhood and husbands once again took over. Barbara left after a 1973 U.K. tour, but Dee Dee kept performing with two new Crystals. LaLa now lives in Vienna, Austria with her jazz musician husband (her high school sweetheart). Barbara is married in Brooklyn with four children. Pat married a serviceman and lives out west. Dee Dee, when not touring, lives in Atlanta.